Hi all! I introduced this pistol in my last video, and this week I'm doing an in-depth review and range report. The 40L is also going to serve as the platform for my transition from iron sights to a micro red dot optic, so it will show up again in a couple of future videos. I hope you like this one! I have always enjoyed an M&P in 40SW. I sold the forst one I ever got due to not liking the lack of grip texture and the trigger. Once the M2.0 came out, my wife got a 5 inch FDE 9mm and she loves it. I then got the same gun, but in 40SW. What a great handgun! The M&P is just meant to be chambered in 40SW I think. Interestingly, the M&P was designed from the ground up for the .40 S&W cartridge. That differentiates it from many other pistols that predate it. Most of the older pistols that were modified to use the .40 S&W were originally designed for the 9mm. A few were originally designed for the .45 or the 10mm. I think that's the reason the M&P seems to feel "just right" when you're shooting the .40 from it. Congratulation on a beautiful gun. I also have a M&P 40L like yours. I know 40 S&W isn't awfully popular right now, but I've always liked the cartridge and it shoots amazingly well from this platform. I've made a few changes on mine that, IMO, just make the 40L and excellent shooter. I'm usually not one for too many upgrades, but it just seemed to have so much potential that I broke down and added the following items. First of all a magwell and magazine extensions from Springer Precision. For some reason the magwell just seems to accent the styling of the long slide M&P, plus it allows for 19 rounds of 40 S&W. 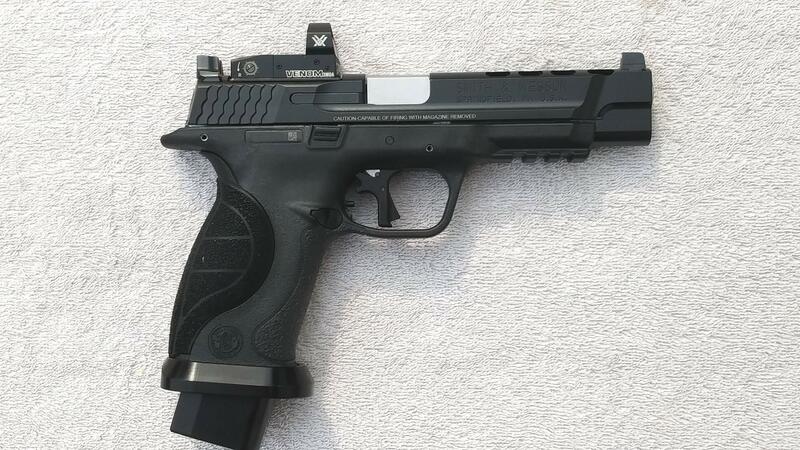 One small detail that I like is the way the shiny finish of the magwell coordinate with the darker color of the slide and the replaceable grip panel on the M&P which is a little darker than the frame. It just gives it a classy look. I also replaced the trigger with the Apex flat faced forward sear and trigger kit. 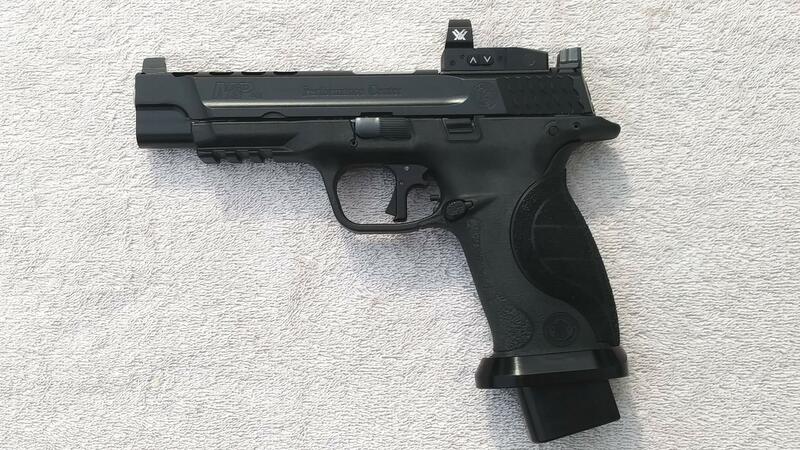 It has made an amazing difference in the trigger and is now one of the best triggers I've ever felt, especially on an M&P. If you go that route, I would also suggest that you install the Apex RAM kit to give a more noticeable reset. With the Apex trigger you can adjust your trigger pull by using various springs. I chose to use springs that give the trigger a really crisp 2 lb 6 oz trigger pull. It really makes shooting it much more enjoyable and since this is a range only gun, I'm OK with the lighter trigger pull. I've also added a Vortex Venom to the 40L. It has also been a big improvement over stock. Good luck with your pistol and let us know what changes you decide to make on it. It's already a great gun right out of the box, but it really shines with a few improvements. Sorry for the huge pics, this is the first time I've posted photos on this forum, and obviously I've got a few things to learn. Great job on the video! I have the 9mm version of your pistol and it's by far my favorite striker fired pistol. I'd have to agree with rbuzz00 on the Apex FSS flat trigger and RAM kit. It makes shooting the pistol so easy and it makes me look like I really know how to shoot, lol. My only complaint is how the dirty the pistol gets from shooting. Dirt/grime just gets all over from the ports. Small price to pay for such a flat shooting gun. I've recently added a Storm Lake threaded barrel for when my suppressor's finally get out of NFA jail.